Final public concert will be videotaped. The performance DVD will be sent to each participant free of charge (i. e. included in the price of the masterclass). The workshop fee covers all masterclass sessions. 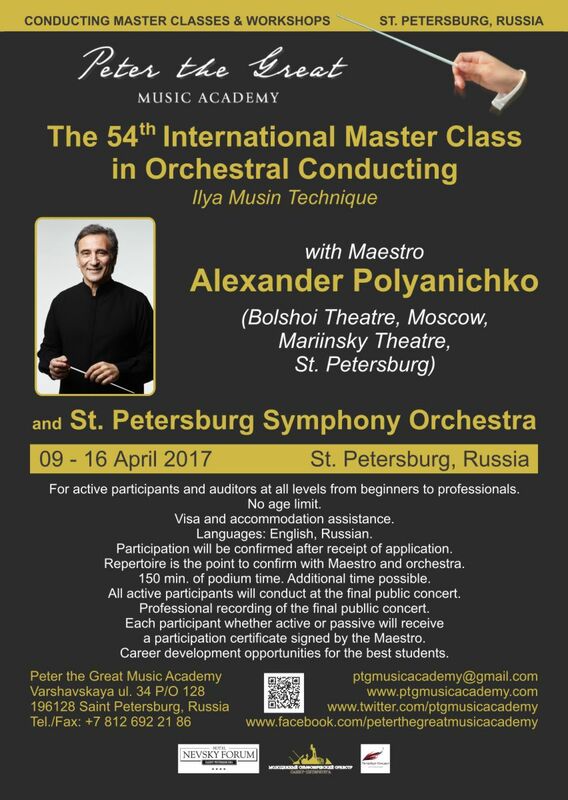 Alexander Polyanichko, an internationally renowned conductor and educator regularly leads conducting masterclasses in cooperation with Peter the Great Music Academy, Royal Baltic Festival, Hermitage Theatre, and St. Petersburg Chamber Philharmonic. A graduate of the Leningrad State Conservatory, and former pupil and assistant of the eminent Ilya Musin (whose students include Yuri Temirkanov, Semyon Bychkov, Valery Gergiev, among many others), maestro Polyanichko has been one of Musin’s biggest proponents, carrying on the great tradition of the St. Petersburg school of conducting. Maestro Polyanichko’s artistry, knowledge, his genuine willingness to share his experiences, sense of humor, friendly and respectful manner of communication, creates a free exchange of ideas, a spirit of collaboration as he and his students search for ways to resolve emerging issues, and a comfortable and productive masterclass atmosphere. Masterclasses traditionally consist of two parts: the first is accompanied by two experienced pianists, and the second gives students the opportunity to work with a professional symphony orchestra. The dress rehearsal preceding the concert is always open to the public, and the culmination of the masterclass is the final concert which is professionally video/audio recorded. During the almost twenty years of teaching masterclasses, Alexander Polyanichko has worked with conductors from countries around the world including Austria, Japan, Italy, Oman, France, Britain, Spain, Denmark, Brazil, Turkey, Germany, Egypt, Belgium, Mexico, New Zealand, Sweden, Australia and the United States of America. Students have consistently expressed their appreciation the pedagogical skills of Maestro Polyanichko and his masterclasses, and have gone on to conduct many successful performances of their own in their respective countries and beyond. Maestro Polyanichko has been a conductor with the Mariinsky Theatre since 1989 and has toured with the company to Europe, Israel, the USA, Taiwan, South Korea and Japan. As a guest conductor he has appeared at many renowned opera houses including the Australian Opera, English National Opera, the Bolshoi Theatre, Welsh National Opera, the Danish Royal Opera, the Deutsche Oper, the Stuttgart Oper, the Royal Opera, Covent Garden, La Scala, the Norwegian Royal Opera, San Francisco Opera and the Opéra National de Paris, and with major symphony orchestras including Chicago Symphony Orchestra, Colorado and Oregon Symphony Orchestras, ABC (Australia) and BBC Symphony Orchestras, City of Birmingham Symphony Orchestra, Hallé Orchestra, Danish National Radio Orchestra, Odense and Aalborg Symphony Orchestras, English Chamber Orchestra, Irish Chamber Orchestras, Novosibirsk Symphony and Chamber Orchestras, Russian National Orchestra, and Saint Petersburg Philharmonic Orchestras. 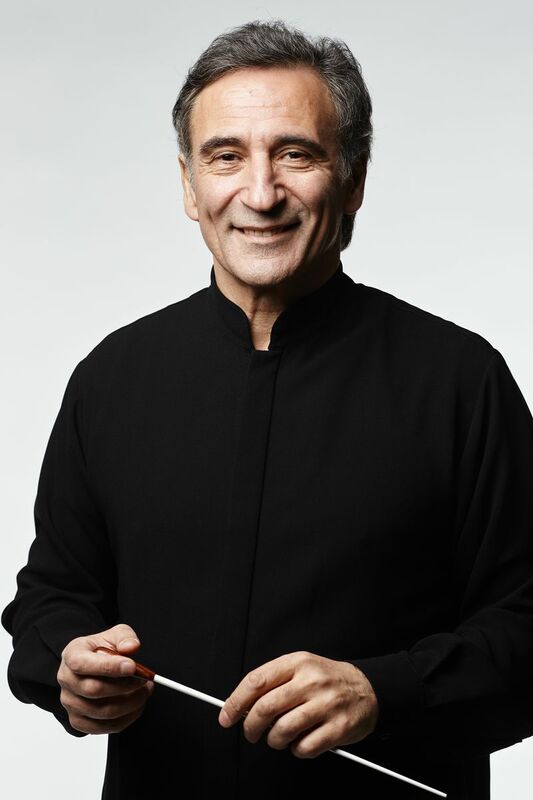 He has served as Principal Conductor of the Rostov Academic Symphony Orchestra, Russia (2012-2015), Bournemouth Sinfonietta, Great Britain, (1997-1999), and Artistic Director of the Byelorussian State Chamber Orchestra, Minsk (1986-1989). Has taught at the opera and symphony conducting faculty of the Rostov State Conservatoire (2012-2015), Leningrad and Belorussian State Conservatoire (1986-1989), and served on juries of the BBC Cardiff Singer of the World competition, Great Britain (2011), and the Rimsky-Korsakov Young Opera Singers' Competition, St. Petersburg, Russia (1996),. Together with the Royal Baltic Festival, the Hermitage Academy of Music and Peter the Great Music Academy he regularly gives international master classes in conducting. Mr. Polyanichko has been featured on the DVD recordings including “Julia & Romeo” by Mats Ek with Royal Swedish Ballet (2013), “Cherevichki/Tsarina’s Slippers” with the Royal Opera House, Covent Garden, London (2009), “Beyond the Score” with the Chicago Symphony Orchestra (2008), on audio recordings on the Melodia label and on live radio broadcasts worldwide. An Honored Artist of Russia, and formerly a violinist in the St. Petersburg Philharmonic Orchestra (formerly Leningrad Philharmonic) under Evgeny Mravinsky, Maestro Polyanichko graduated with honor from the faculty of opera and symphony conducting of the Leningrad (St. Petersburg) State Rimsky-Korsakov Conservatoire (1988) and served an assistant to Professor Ilya Musin- an honor given to a highly selected few. He received the First Prize Laureate at the 6th All-Union Conducting Competition.